“We are going to make the biggest fight possible and everybody knows what that fight is-the little fella”. The Mayweather team went so far as to give a date, May 5, 2012 and a venue the MGM Grand in Las Vegas. Of course the “little fella” that Ellerbe was referring to is World Boxing Organization (WBO) welterweight champion Manny Pacquiao, the fighter that Floyd can’t seem to get out of his head. Boxing writers gleefully reported the news, almost tripping over themselves to be the first to report the scoop on when and where Floyd’s next fight would be. Mayweather has taken the manipulation of the media to a new level. Everything he “leaks” to the press, no matter what it is, is immediately reported. The one thing the Mayweather camp failed to report in their arrogance was that they failed to notify the Pacquiao camp. The fact that the Pacquiao camp was not contacted with regard to the supposed May 5, 2012 fight gives one pause to wonder if is sincere. After all, while Mayweather may be the Pay Per View (PPV) king in the USA, Pacquiao is the most popular fighter in the world and you would think that he should have some input as to when and where the Pacquaio – Mayweather fight should take place. As they say in politics the whole thing does not pass “the smell test”. In addition when Mayweather adviser Leonard Ellerbe referred to Manny Pacquiao as “the little fella” it immediately cast doubt as to the seriousness of the Mayweather camp. If you were in fact serious about attempting to put together perhaps the biggest PPV fight in history why would you begin negotiations by insulting the party you intend to close the deal with? It brings to mind the racist rant Mayweather put on You Tube about Pacquiao in 2010. 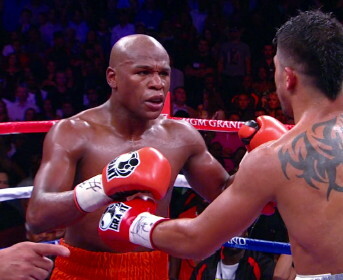 Mayweather may very well fight against someone on May 5, 2012. It is unlikely however if the fighter in the opposite corner will be Manny Pacquiao. And once again Floyd will convince his legions of followers that Pacquiao is the one holding things up. With Floyd’s latest attempt to take the spotlight off of Manny Pacquiao, he may have unwittingly helped to boost the PPV buys of the Filipino icon by drawing more attention to Pacquiao and his upcoming fight with Juan Manuel Marquez.